This is my interview with Ibu Ni Luh Kartini for Let's eat! Magazine April 2015 edition. I consider this as one of the most important interview in my career as a writer since it tells the achingly true story about the agriculture condition of Bali. Read the full interview below. 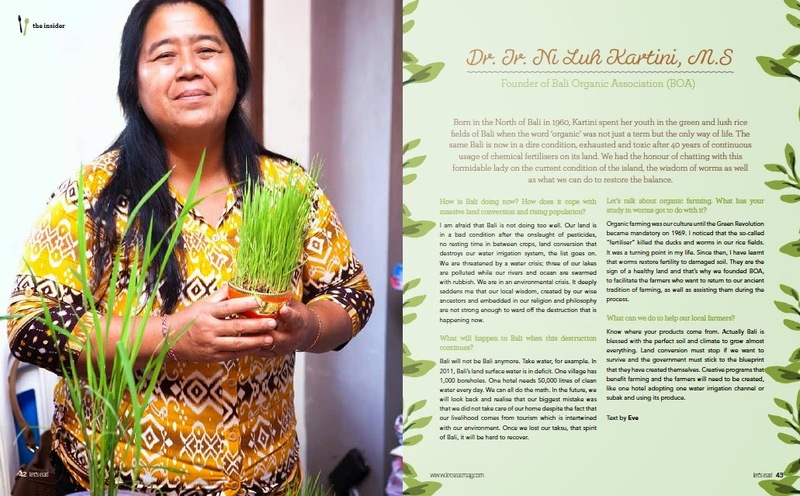 Born in the North of Bali on 1960, Kartini spent her youth in the green and lush rice fields of Bali when the word ‘organic’ was not just a term but the only way of life. The same Bali is now in a dire condition, exhausted and toxic after 40 years of continuous usage of chemical fertilizers on its land. We got the honour to chat with this formidable lady on the current condition of the island, the wisdom of worms as well as what we can do to restore the balance. How is Bali doing now? How does it cope with massive land conversion and rising population? I am afraid that Bali is not doing too well. Our land are in a bad condition after the onslaught of pesticide, no resting time in between crops, land conversion that destroys our water irrigation system, the list goes on. We are threatened by water crisis; three of our lakes are polluted while our rivers and ocean are swarmed with rubbish. We are in an environmental crisis. It deeply saddens me that our local wisdom, created by our wise ancestors and embedded in our religion and philosophy are not strong enough to ward off the destruction that is happening now. What will happen to Bali when this destruction continues? Bali will not be Bali anymore. Take water, for example. On 2011, Bali’s land surface water is in deficit. One village has 1,000 boreholes. One hotel needs 50,000 litres of clean water every day. We can all do the math. In the future, we will looked back and realize that our biggest mistake is that we do not take care of our home despite the fact that our livelihood that comes from tourism is intertwined with our environment. Once we lost our taksu, that spirit of Bali, it will be hard to recover. Let’s talk about organic farming. What does your study in worms got to do with it? Organic farming was our culture until the Green Revolution became mandatory on 1969. I noticed that the so-called “fertilizer” killed the ducks and worms in our rice field. It was a turning point in my life. Since then, I have learnt that worms restore fertility to damaged soil. They are the sign of a healthy land and that’s why we founded BOA, to facilitate the farmers who want to return to our ancient tradition of farming, as well as assisting them during the process. What can we do to help our local farmers? Know where your products come from. Actually Bali is blessed with the perfect soil and climate to grow almost everything. Land conversion must stop if we want to survive and the government must stick to the blueprint that they have created themselves. Creative program that benefit farming and the farmers will need to be created, like one hotel adopting one water irrigation or subak and use its produces.